was heated with two wood stoves in the nave. The original St. Luke’s consisted of the main part of the church. The porch and foundation complete with a hall were added some time later. The first Wardens of St. Luke’s were Les Deal and Bill Milsom. Over the years through generous donations, St. Luke’s was able to install new windows with stained glass panes and purchase new vessels. 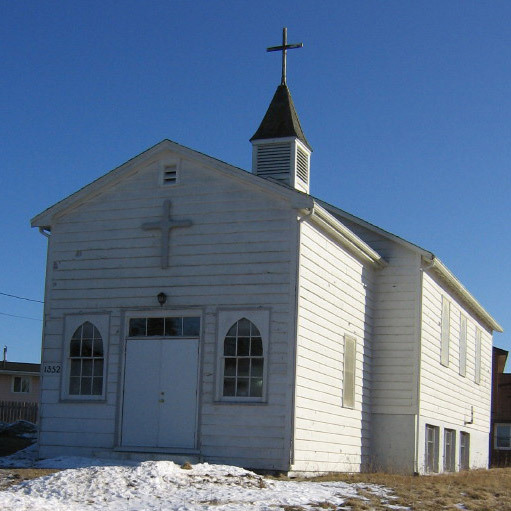 Eventually St. Luke’s became part of a four point parish which included St. Andrew’s, Timberlea, St. Paul’s, Terrence Bay, and St. Timothy’s, Hatchett Lake. During the years St. Luke’s has been served by the following clergy: Rev. G.C. Brown, Rev. E Poirier, Rev. Doering, Rev. Canon Williams, Rev. Richard Mowry, Rev. Les Dignan, Rev. Greighton Brown, Rev. Robert Coote, Rev. David Boston, Rev. Fred Hiltz (who is now the Primate of the Anglican Church of Canada), Rev. Duanne Tanswell, Rev. Ron Walker, Rev. Steven Brown, Rev. Ann Harrington and Rev. Michael Conrad. Rev. David Boston was the last rector to serve St. Luke’s as part of a four point parish. As Rev. Boston was moving on, St. Luke’s along with St. Andrew’s in Timberlea decided it was time for full time ministry and they formed the Parish of Timberlea- Lakeside. St. Luke’s had a small congregation but they loved their church and kept it going for many years. In late 2008, Rev. Michael Conrad, rector of the parish, met with the congregation and talked to them about closing the church for the winter because of the cost of heating and snowplowing. Facing dwindling numbers in worship, dwindling revenues, and rising expenses the congregation decided to make a very courageous decision that would see them permanently close St. Luke’s. They felt that their mission and outreach would better be served if they joined St. Andrew’s focusing their resources and energies as part of a larger congregation. The decision was made at that meeting that they would continue services until Christmas, gather again for Easter and then ask the bishop to officiate as the St. Luke’s was deconsecrated. On Christmas Eve at 4:00 p.m. in 2008, St. Luke’s celebrated their last Christmas Holy Eucharist to a packed church. As much as this should have been a happy occasion it was also a bit sad. It marked the beginning of the end of more than fifty years of Christian witness from that location. Following that service members of the congregation began attending St. Andrew’s Church in Timberlea, until Easter of 2009 when the little church on the hill gathered its flock for what would be the last celebration of Holy Eucharist at St. Luke’s. The last service held in St. Luke’s was on April 12, 2009, Easter Day. The church was packed with members from both congregations along with members of St. Andrew’s choir. There was standing room only as the church rang out with the hymn “Jesus Christ is Risen Today, Alleluia!” Fitting for the occasion was the celebration of holy Baptism, a wonderful sign of resurrection, which was exactly what was taking place with St. Luke’s. Since the initial meeting where it was decided to close the doors of St. Luke’s members from that congregation, along with members from St. Andrew’s, have met to discuss ways of using the assets from St. Luke’s to honour that congregation while strengthening the now unified congregation at St. Andrew’s. Finally, on August 30, 2009, Bishop Sue Moxley deconsecrated St. Luke’s Church with a service that began at St. Luke’s and finished at St. Andrew’s. Again, this is symbolic of the Easter message of resurrection. The little church on the hill, as people have always referred to it, has lots of happy memories for the congregation that kept it open and welcoming for more than 50 years.